The Beauty of Red Roses: Bloom Cosmetics FREE Express Manicure- 2 days only! 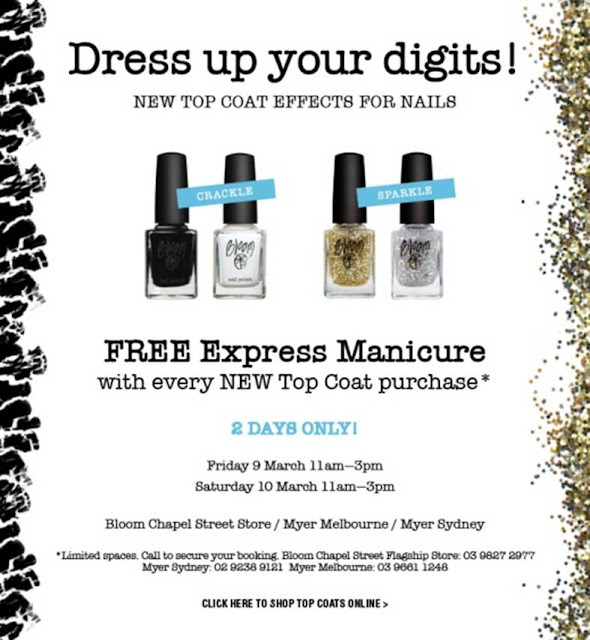 Bloom Cosmetics FREE Express Manicure- 2 days only! Bloom Cosmetics has recently launched two sets of Top Coat Effects for nails and they are called Crackle (black and white) and Sparkle (gold and silver). If you haven't got your hands on these, be sure to step into Bloom Cosmetics stores on Chapel Street, Myer Melbourne and Myer Sydney to get your FREE express manicure with the purchase of one of these funky new top coats! Have you tried any of Bloom Cosmetics Top Coat Effects for nails before? What do you think of them?